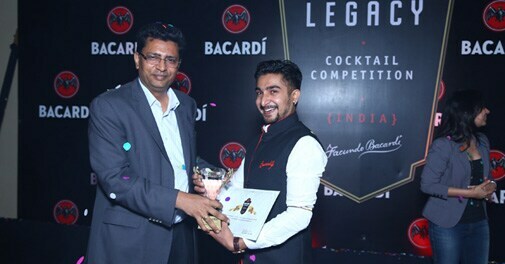 Mixologist Manmohan Singh from PCO, Delhi, wins a ticket to the International Bacardi Legacy Cocktail Competition, to be held at Moscow in May 2014 . Vijay Subramaniam, Managing Director of Bacardi (India & South East Asia) with Manmohan Singh, winner of BLCC India- 2014. How would you like your drink? This was the question posed to the thirteen most promising bartenders (named 'The Untameable 13') chosen for the Bacardi Legacy Cocktail Competition held at the Trident Gurgaon, among seven acres of landscaped gardens, walkways, courtyards and fountains - on April 3, 2014. In response, the bartenders quickly took out their shakers and muddlers, and before the excited audience even realised it, there were miracles happening in chic little cocktail glasses. But then, there can only be one grand victor, and the judges overseeing the national finals - stalwarts such as Vijay Subramaniam, managing director, Bacardi India; Nitesh Gandhi, general manager, The Trident (Gurgaon); and Aki Eguchi, the numero uno mixologist in South East Asia) - were faced with the unenviable task of picking the creme de la creme of the lot. The judges were personally served their cocktail creations by the thirteen contestants one by one, even as they passionately recalled the stories behind their meticulously perfected recipe and drink presentation. When the hour of judgment came, the grand winner's title for 2014 was handed over to Manmohan Singh from PCO, Delhi, for his signature cocktail '19th', named after the 19th Amendment (which gave women the right to vote in the United States way back in 1919). The first runner-up award went to Tobais Carvalho from Ellipsis, Mumbai, for his cocktail 'Amalia'. The second runner-up award was a tie between Hariharan R (the man behind the F5 cocktail) from High Sky Lounge, Raintree, Chennai, and Ami Behram (for Flavours of India) from the Flair Witch Project, Mumbai. Manmohan Singh (who, oddly enough, is the namesake of the current Indian premier) will now battle it out for global recognition with international contestants at the Global Bacardi Legacy Cocktail Championship, to be held at Moscow in May 2014. Here's to wishing him luck. As part of this competition, Bacardi-selling nations across the globe host local regional rounds to cherry-pick a local finalist who then competes for the national title at the Country Finals. The finalists then promote their drinks through the social media to gather public opinion. It takes time for a drink to become a true classic on the lines of Cuba Libre and the Original Mojito, and the results of this promotion indicate its potential to become a legacy. National winners from places across the country then vie at the Global Finals for the International title - and the winning drink is recorded in the Bacardi company archives for generations to come.